For higher education HR administrators and supervisors, the Hirezon Onboarding System provides the ability to quickly create customized new-hire welcome packets for employees, with or without benefits. Each packet consists of one or more onboarding employment-related forms, including I-9 and W-4. HR administrators have wide flexibility in assigning user privileges to other staff in the organization. Assigned users can access the system anytime from any Internet-connected computer. Configurable settings allow selective online routing of onboarding forms, including granting access to individual forms based on specific user permissions (e.g., I-9 to HR, W-4 to payroll, etc.). The system also ensures that a complete online audit trail is maintained. Hirezon’s Onboarding System for Higher Education is compliant with industry-wide standards for login, email and overall security, and collects and maintains onboarding information using HTTPS/2048-bit encryption. Our data centers are SOC 1, SOC 2 and SOC 3 certified. The Onboarding System has reporting capabilities for all users to manage the onboarding cycle in terms of where new hire employee are in the process. Tracks and archives information through all phases of the onboarding process. The institution has full control over the retention and destruction of historical higher education onboarding forms. Mobile friendly new hire portal with responsive web design (RWD) supports new hires to complete the onboarding forms and attach all supporting documents using their mobile devices. Accessibility and usability of new hire portal is in compliance with Section 508 and ADA. 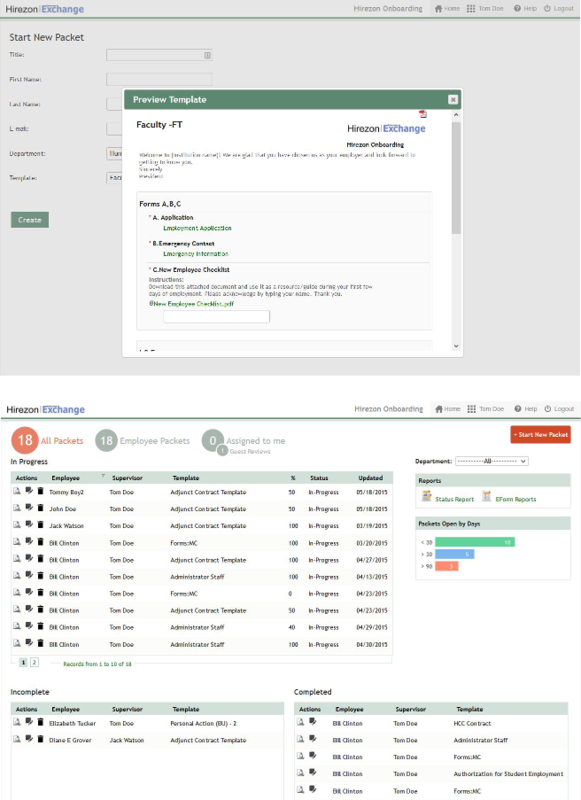 Seamlessly integrates with Interview Exchange Applicant Tracking System for Higher Education.